The island of St. Barthélemy, more commonly called St. Barts, is above and beyond one of the most prestigious, magnificent and well-travelled islands in the Caribbean. It is the go-to holiday destination for the world’s elite, due in part to its incomparable climate, beautiful geography and world-class accoutrements, including dining, shopping and nightlife. It is indisputably THE Caribbean island that best embodies the spirit of opulence, hedonistic pleasure and freedom of luxury private villa rental vacations. The island itself takes up a mere 25 square kilometers in the Caribbean Sea, roughly 150 miles East of Puerto Rico. Being small is one of the greatest assets to guests of the islands many luxurious private villa rentals, as any feature – geographic, historic, commercial – and experience of St. Barts is quite literally a stones throw away. To put it simply, if you are looking to ensure that you and your travelling companions experience the end-all and be-all of Caribbean villa experiences, St. Barts is the destination you want. The pomp, the calibre of accommodation, the earthly pleasures and the overwhelmingly high-class lifestyle of the island and its residents cannot be understated and are very, very hard to beat, indeed. The capital of Gustavia is home to the finest, up-scale couture shops imaginable: gifts and indulgences of every kind can be found here. Similarly, anyone who prides themselves on excellent taste in cuisine will wish never to leave after experiencing the islands five-star dining. 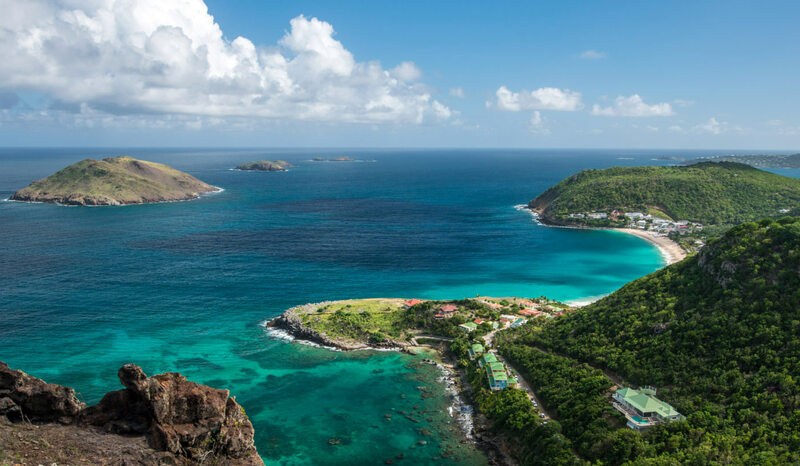 Located on the western side of the island, Gustavia is a popular destination for hikers and the port itself has a wonderfully rich history, having been occupied at different times by the Portuguese, French, English and Swedish. Further, Gustavia provides guests with a central hub to everything the island has to offer. Public access docks on the harbour allow visitors to browse amongst the mega yachts that land there, walking right up and touching the hulls. The restaurants, bars and night life scene are all conveniently located in one place, rendering everyone equals in extravagance. The climate of St. Barts could not be more inviting for your dream vacation. The lowest recorded temperature on the island was a chilling 55 degrees Fahrenheit, and St. Barts sits comfortably between 86 and 72 degrees Fahrenheit throughout the year. Once you factor in the wonderfully low humidity due to the breeze off the Caribbean, guests would be hard pressed to find a more perfect climate in which to indulge their island fantasies. Tourism makes up the majority of the islands economy, and guests will learn this to their great delight. No expense is spared in pampering and providing for travellers to St. Barts, and every pleasure imaginable can be found in this luxury Caribbean private villa rental paradise. Airport: Gustaf III Airport – located in the village of St. Jean, this is the only airport on the island. Small and incapable of handling commercial jetliners, Gustaf III is instead serviced by smaller aircraft from neighbouring islands (specifically St. Martin, which is the most common hub for access to St. Barts with a flight of only 12 minutes running ONLY during daylight) and ferry service, lending to the exclusivity for which St. Barts is known. Private Villa Rentals offers pre-booking of flights and ferry service into St. Barts. Ferry service is available all day from Marigot, Philipsburg and Oyster Pond (St. Martin) into Gustavia in case of flight delay, though ferries can be a bit rough and anyone prone to seasickness should be wary. Flight times to St. Martin from major cities: New York City = ~4 hours, Chicago = ~5 hours, Toronto = ~4.5 hours. Non-stop air travel is supported out of Puerto Rico, primarily the capital of San Juan, one of the busiest airports in the Caribbean. Currency: St. Barts uses the Euro as its primary currency; USD is widely accepted on the island. St. Barts is a small island and fresh water is collected primarily through rainwater. As such, guests are encouraged to be respectful of their water consumption as additional water fees can be incurred. Easily St. Barts most well-known and boasted feature is its chic, upscale shopping districts and boutiques, where some of the most fashionable of the Hollywood elite find their most daring, colorful ensembles. Designer brands like Louis Vuitton, Hermes, Cartier and Bulgari are but a few on display, and guests will come to feel themselves amongst the posh and the powerful as they browse the boutiques of St. Barts. For those who feel the need to begin their world-class shopping experience as soon as possible, the La Savane Commercial Centre, located just across from Gustaf III Airport in the village of St. Jean is the place to be as soon as you clear customs. St. Jean itself boasts a number of unique and well-stocked boutiques. The most famous shopping on the island is to be had in Gustavia itself, where there exist not one, not two, but three main shopping rows, Quai de la Republique, Rue du Roi Oscar II and Rue de General de Gaulle. Even the most haute, chic and fastidious fashion connoisseur would be hard pressed to frown at the limitless and magnificent items on display in this mecca of fashion and style. Annually, a number of exciting special events take place on St. Barts, which entice yet more of the worlds top figures into joining the islands revelers, including the prestigious Bucket Regatta, which features 40 or more of the worlds most opulent superyachts competing for supremacy in what is truly a once-in-a-lifetime experience to witness. Like any tourist economy, St. Barts has its high season and its low season. Those in the know, and by that I mean the world elite who own or vacation on the island, know this not to be in any way a negative. Instead, it’s simply one more way for guests to tailor their experience to what they’re after. St Barts high season, which runs annually between December and April, including the Christmas and New Years holidays, is for swank parties, bustling ports, thrilling nightlife and the excitement that comes with so much celebrity: enjoyable for those seeking to really immerse themselves in the highlife. Christmas and New Years celebrations: the infamous end-of-year celebrations on St. Barts attract some of the worlds most prestigious and wealthy people – witness the majesty of some of the grandest yachts ever made as they sail into the harbor at Gustavia. St. Barths Music Festival – a grand celebration of the reggae, meringue, calypso and soca music that have such an enormous impact on the culture of the island, takes place in the later half of January, each year. St. Barth Bucket Regatta – an annual, three-day racing event in March that began in 1995 and plays host to some of the most spectacular sailing craft from across the world. Races and celebrations are known around the globe. The low season, generally speaking between mid-May and November, is perfect for those wishing for the real essence of a private villa rental experience. Serenity, security, privacy and the intimacy that only a beautiful setting can provide. Regardless of your preference, St. Barts remains a wondrous and giving host year-round for everything that is luxury Caribbean private villa rental. Windward Fete Festival – occurs every August in the village of Lorient and includes a weekend of regattas, music and a fishing tournament. Fete de Saint-Barthelemy – an annual celebration in August in commemoration of the islands patron saint and namesake, which includes – as always – regattas, grand government ceremonies, parades and a celebration of dancing and fireworks. St. Barts Cata Cap – one of the major catamaran competitions held in the Caribbean, attracting some of the worlds top racers. While any island can offer sun and fun for a wonderful private family Caribbean getaway, only St. Barts can offer such an escape paired with the utmost in worldly indulgences and pleasures. The unofficial winter home of the worlds most glamorous, wealthy and famous people, St. Barts generously offers its guests a slice of this very same life. Sunshine, carefree fun, peace, serenity, romance, intimacy, five-star eating, shopping and living: these are the promises of St. Barts and these are the things that set this bountiful and beautiful Caribbean island above and beyond any other. Like everything else on St. Barts, we strive endlessly to make sure that our services are absolutely and completely world-class, going to any lengths to ensure that guests to the Caribbean jewel that is St. Barts are pampered and cared for at every imaginable turn. From the moment you and your guests touch down on St. Barts, we’re there to guide you, ensuring your absolute peace and serenity throughout the entire experience. Our concierge staff can coordinate private retrieval from Gustaf III Airport or the marina for arrivals at any time. We gladly handle private vehicle quotes and booking so that you have personal transportation at all times during your stay. As for your villa itself, we would be honored to coordinate the provisioning of the property with food, drink and every available luxury prior to your arrival, make restaurant reservations ahead of time at any of St. Barts world-famous, five star establishments and arrange for a personal chef for your villa, leaving you free to do nothing but experience the island as it was meant to be experienced: in complete, carefree, unadulterated joy. Simply let us know exactly how we can be of service to you and yours and we’ll take it from there! Your job? Live.